Because nobody wants to fight with a 20-year-old portable crib when they get to grandma's house. Even if you’re fine crashing on whatever couch will have you, your baby needs a more reliable place to get some shuteye on your next family vacation. Traveling with a baby means navigating unfamiliar settings, dealing with crying and screaming at inopportune times, and fighting that nagging feeling that you forgot something important. When you finally reach your destination, you don’t want to worry about getting your kid to fall asleep. A travel crib, a portable, enclosed sleeping surface designed for babies, makes it easy for baby (and therefore dad) to get some sleep after a long day on the road. So whether you’re bringing your kid to the grandparents’ house or Disney World, don’t forget a travel crib. The great ones are lightweight and fold up compactly. They’re easy to carry, and they open and shut smoothly with minimal effort. They also have removable mattresses and/or washable mattress covers, because, you know, babies. We looked the travel cribs on the market and found some great ones. They have stellar great customer reviews, and they’ll give your kid a comfortable place to sleep and you one less thing to worry about on your next trip. If you have a newborn, this is the travel crib for you. This go-anywhere bassinet weighs less than two-and-a-half pounds and has a built-in carrying handle. To break it down, all you have to do is push the four release buttons and fold it in half. Pros: The fact that there are four buttons means that your baby won’t accidentally fold it up, which would be disastrous. 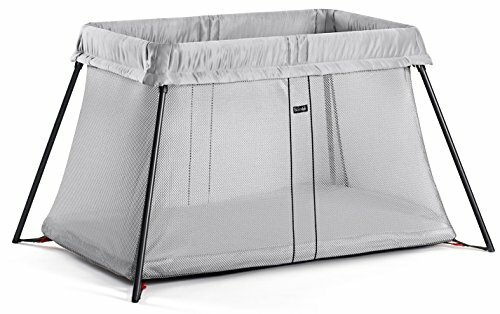 Mesh sides ensure the baby enjoys a comfortable snooze and the removable, water-resistant mattress pad and fitted sheet set are included. It’s also quite affordable. Cons: The Brica Fold N’ Go is designed for infants up to three months old, so you won’t get a ton of use out of it. The beauty of the Lotus is that it's designed to save your aching back. Rather than having to lean over the mesh walls of the crib to put down and pick up your baby, this clever crib features a zippable side-panel door that lets you slide your little one in easily. Even better, you can leave it open during playtime so you kid can crawl in and out on his own. Pros: In transit, the backpack straps make it easy to carry with you. And when you arrive at your destination, it only takes 15 seconds to set up the Lotus. Cons: The mattress is a weird size, and reviewers have said that you should stick with Guava Family sheets, which gives you less flexibility than a standard size crib. 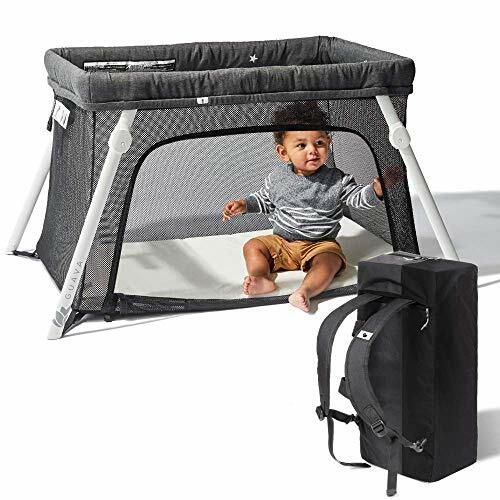 Ease of use is paramount when it comes to portable travel cribs, which is why the Baby Bjorn's one-motion set up is so attractive: simply pop the frame open and the legs automatically swing into place. 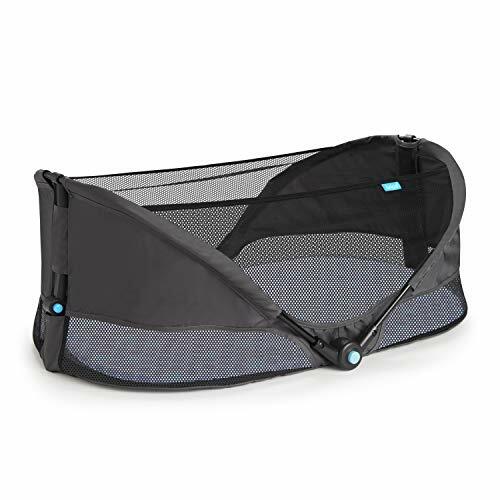 Pros: The slightly tapered shape makes this crib nice and stable, and the mesh sides make it both cool for your sleeping baby and lightweight for your back. Cons: It’s on the expensive side, and it’s not small enough to fit into the overhead compartment of a plane, so expect to check. This play yard has a patent-pending, removable divider that creates separate sleeping spaces (27-inches by 20-inches) for two infants or toddlers. It's hard to understate how great of a feature this is for parents with multiple kids of crib age. It could also come in handy if, you're joined by your toddler niece or nephew on a family trip. 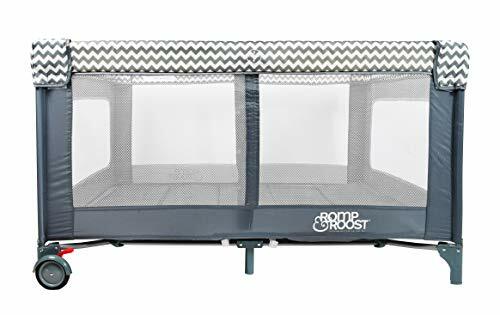 Pros: When the divider’s out, the Romp & Roost is basically the baby equivalent of a California king. 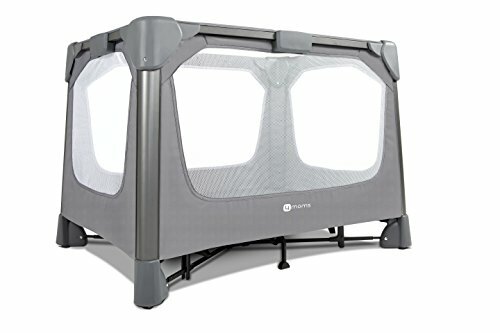 Given its larger size, this thing isn’t fitting in the overhead bin, but it does pack into a zip-up storage bag that can be rolled using the travel crib’s lockable wheels. 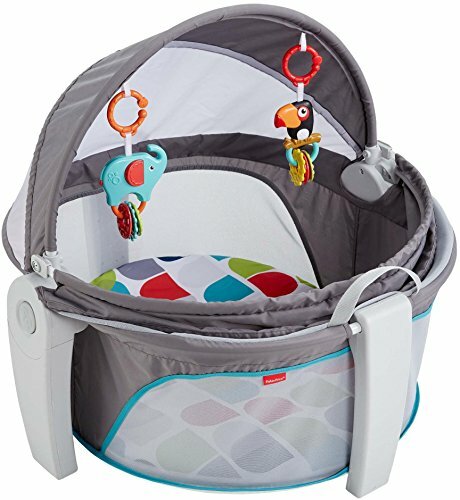 Cons: You need a bag with wheels because, at 33 pounds, this is one of the heavier cribs on this list. Cons: The included pad isn’t the comfiest surface ever, so if your kid is a fussy sleeper you might want to invest in something with more padding. 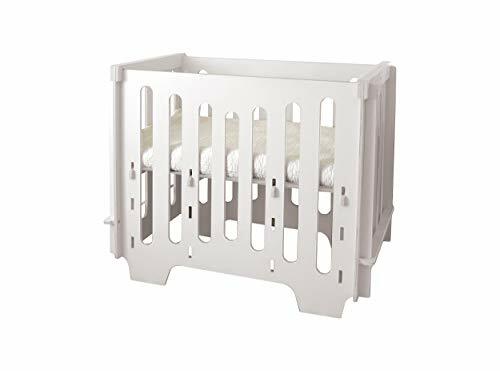 Every travel crib on this list is relatively easy to set up, but the 4moms breeze GO is the simplest. Push down on a central hub and the legs extend/lock into place automatically. To pack it up, pull on the central hub strap and to automatically release the locks and contract the legs. Pros: It comes with a travel bag, and the mattress is designed to be cleaned with a damp cloth. Suitable for babies up to 30 pounds. Cons: Doesn’t come with sheets, a bassinet, or a changer (as other 4moms models do) despite its steep price. Designed by a father-daughter team of architects, the Noninoni Mini is a full crib you can fit in the car trunk. It's a real wood travel crib that can be assembled in under two minutes without tools ⏤ no Allen wrench, no screws, no bolts. It packs up flat, so it's perfect for car trips. Pros: It is the sturdiest crib on this list. You can use it as an everyday crib and, with three mattress positions, it can grow with your kid. Cons: It’s definitely on the pricier end of this list, and at 55 pounds, it’s on the heavier side. If you want maximum portability, look elsewhere.